Whole Food Wednesday: The Incredible, Edible EGG! The other day on Twitter I saw a comical tweet: What do you put on your egg whites? They are so bland. The reply was the best part though. It said simply: Yolks! Well, yah! Egg whites by themselves ARE bland. That is why God or nature or evolution whatever you believe in (I’m going to hedge my bets and go with God) designed them with yolks. Like most foods, eggs are best eaten in their whole form, with all their parts intact. And not just because they taste better that way — although of course they do — but because they are more nutritious that way. Egg yolks contain choline, an important nutrient that helps regulate the brain, nervous system, and cardiovascular system and may help prevent breast cancer. They also contain lutein and zeaxanthin, which help lower the risk of developing cataracts as well as macular degeneration, a debilitating condition from which my husband’s grandmother suffered. I wouldn’t recommend it. 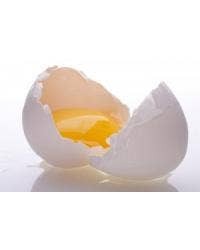 Eggs also contain vitamins A, K, E, D, B-complex and minerals iron, phosphorus, potassium and calcium. So, feel free to scramble ‘em, fry ‘em, boil ‘em or throw them raw into a delicious smoothie. Eggs are good for you. But not just any old egg. Eggs from pastured chickens are best. Pastured chickens are raised on fresh green grass and allowed to feast on grubs and bugs and whatever else they peck out of the ground, the way nature intended. Unfortunately it is nearly impossible to find these eggs at your local mega mart. You will have to ask around and find a local farmer. Even the boxes marked “free range” or “all natural” or “organic” are misleading. Good: Eggs are good for you. If all you can find or afford are the conventional grocery store variety, eat them anyway. BEST: Pastured chicken eggs — eggs from chickens who are allowed to roam around outside, pecking at the grass, eating insects and worms. Pastured eggs are richer in nutrients (such as vitamin D, beta carotene, and those omega-3 fats that are so good for us) than their conventional counterparts. Also, it appears that they may be lower in cholesterol and saturated fat. And whether or not they are any healthier, they simply taste better. I am happy to support fresh, local foods whenever possible. To find free-range pasture farms, try your local health food store or you can get recommendations from EatWild.com and LocalHarvest.com.